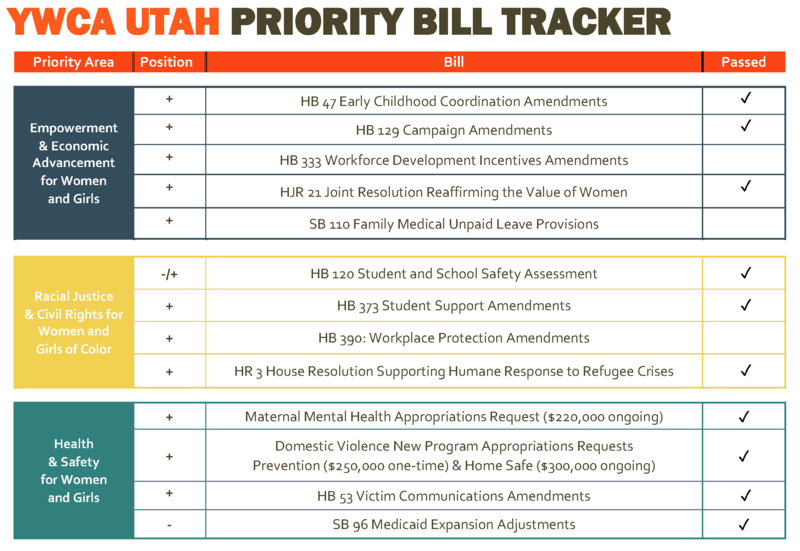 We’ll keep you informed about bills that affect you with the YWCA Utah Bill Tracker. Year-round, we work with statewide partners and legislators to make policies that benefit all Utah women and girls. See more bills we track below. Raises the marriage license fee from $10 to $35 to provide funds for domestic violence shelter operations. Modifies jail release conditions, strengthens protections for domestic violence victims. Requires law enforcement to report data on frequency of, and response to, domestic violence offender attempts to illegally purchase firearms. Changes eligibility requirements for expansion population, lowers number of people covered, imposes spending caps. Repeals expansion of state Medicaid program (2018 Ballot Proposition #3). Policy priorities are informed by the YWCA Utah Public Policy Committee, YWCA member feedback, and YWCAdvocacy Connect policy survey responses, and The Well-Being of Women in Utah Fact Sheet, which we will continue to publish annually with the Institute for Women’s Policy Research. Learn more about our 2019 Policy Priority Areas and policy work for all women and girls in Utah.